TAU 1 - Electrodata, Inc. 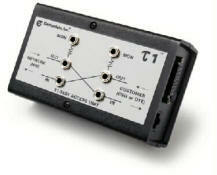 The TAU 1, T1 Test Access Unit, provides complete test access to T1 circuits. Easily installed between a CSU (channel service unit) and the NIU (network interface unit) or SmartJack, the TAU 1 provides a technician with clearly defined test connections. Monitor jacks allow isolated connection to the output signals of both the CSU and NIU. Each monitor jack is resistively isolated and provides a signal 20 dB below the primary signal level. The TAU 1 also provides direct terminating access to both the NIU and the CSU. A test set can be connected as a terminating device or “hard loopbacks” can be installed by placing a bantam patch cable between the output and input connections.